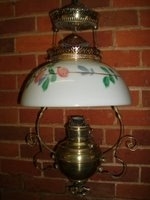 Listed are a number of lamps I currently have for sale (either outright or on consignment). If you have any enquiries please do not hesitate in contacting me. Those listed are only a representation of what I have available. Lamps are constantly passing through my hands. 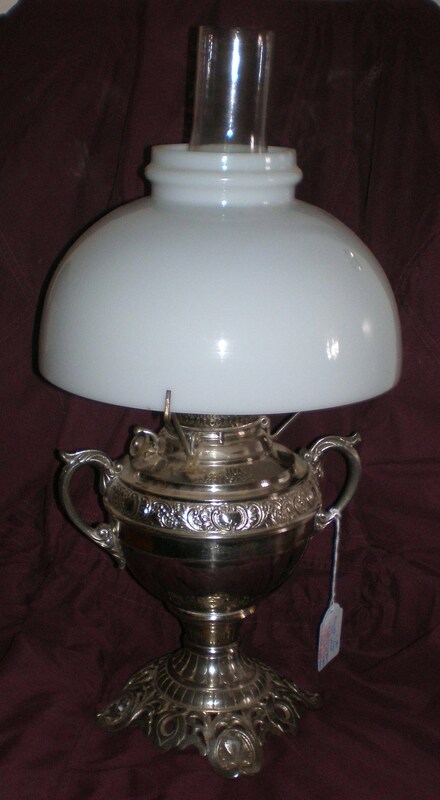 If you are interested in aquiring a Genuine Miller lamp please do not hesitate in contacting me. All prices are in Australian (AU) dollars - postage extra. I am happy to list any lamp on ebay as a buy it now buy arrangement if you are more comfortable in trading through that medium (a small surcharge applies). All of the lamps I sell are serviced and ready to give years of use. I also offer 'after sales service' and am happy to be of assistance. 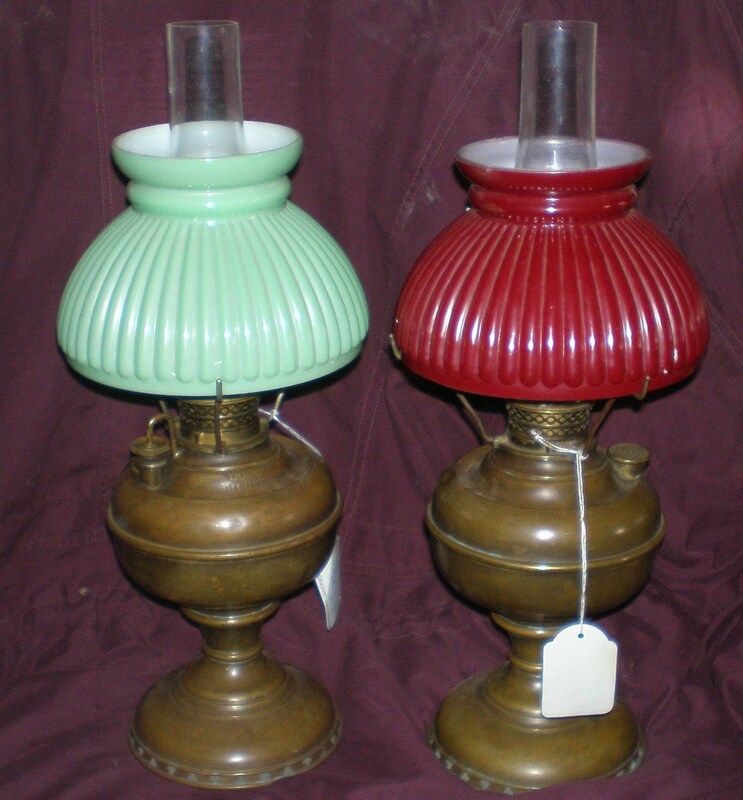 Kerosene lamps do not only look good and represent an era of household lighting that existed during the late Victorian and early Edwardian periods but remain functional - be it a back up during electrical failure or to obtain a ambiance that traditional soft lighting can only obtain. Adjustable, standard #2 size central draught lamp is equivilant (on average setting) to a 60w light blub - and can be dimmed or brightened to suit your needs. I can accept direct bank deposit (Australian customers only) or paypal (preferably only from paypal account balances or bank account transfers - I can only accept payments from credit or debit cards if advised in advance (again a small surcharge applies to assist in covering costs). I post world wide and only charge actual postage - never a handling for packing fee. A plain but pretty lamp. Fitted with a plain (unembossed) 'Juno' font of c. 1895 the plain white shade is most likely a replacement from c. 1930's. The origin of the bone china vase cannot be established, nor can its age. It may be original, but equally might be from the 1960's and thus it cannot be establsihed if it is of Miller origin or not and therefore priced accordingly. Fount is fully serviced and functional. Height (to top of burner) 14"
A fine banquet lamp of modest proportions. Excellent quality Miller cast spelter vase, capital, footing and base. Some deterioration to the original finish on the base but does not detract. Onyx stem. The fount is the scarce A1 Low shouldered 'New Juno'. Serviced and in good working condition. 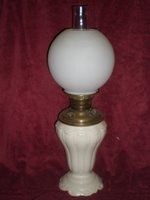 Height to top of burner 20 1/2"
An Elegant palour lamp - all original. Ring set is original and matching. The vase retains its original red enamelling, however is showing signs of wear (if does not suit options of restoration are available). Fully serviced and functional. Complete with embossed ceiling canopy and serviced ceiling clutch. Fully serviced and fitted with a new sick and chimney. 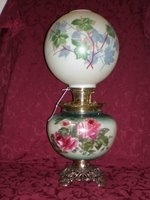 This exceptional vase lamp is of unusual size. Displayed with an early, but not original or matching shade this lamp is fitted with a fully embossed Miller 'New Juno' removeable fount of a scarce pattern, #2 burner and a fine pressed brass vase crown. 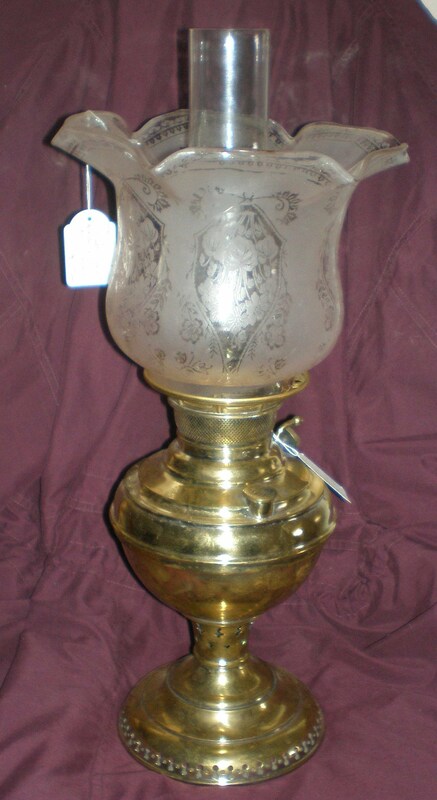 Hieght to top of shade 25" - Diametre of vase 10 1/2"
A plain polished brass vase cup lamp of elegant proportions. 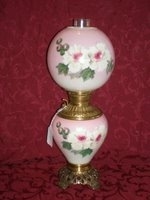 Decorative handles and base are of finely cast rose brass. A plain removeable Juno fount, #2 burner and is fitted with a lightly embossed vase crown. Fully serviced and fitted with a new wick. Height to top of burner 12" - Diametre of vase 7 1/4"
A fine Miller 'Juno' brass vase lamp of simple proportions. 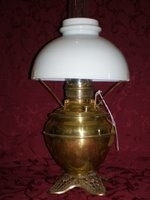 Showing the full range of the Miller factory is this fine but simple brass cup lamp with a decorative cast base. Fitted with a serviced Miller 'Juno' removeable fount #2 burner and new wick and chimney. 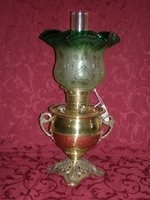 Hieght to top of burner 12" - Diametre of vase 7 1/4"
A attractive decorated Miller 'Juno' vase lamp. 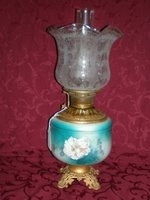 This Miller 'Juno' vase lamp has finely painted white flowers with a almost aqua background. Fitted with a Miller 'Juno' embossed removeable fount, #2 burner and cast base this lamp is of fine proportions. It will be fully clearned and serviced when sold and fitted with a new wick and chimney. Here is a nice pair of scarce #0 bedside table lamps. These lamps are original except for being fitted with a reproduction flame spreader (the original spreader having burnt out - quite common with these smaller lamps) which is a copy of the original and does not detract from the appearance with the lamp in any way. Displayed here with original 6" tripods and early 6" ribbed shades, the lamps can be supplied with matching shades if desired (no difference in price).